You will have to click the image to really appreciate this car. Built by Ford Racing Performance Parts (FRPP) to show off it 5.0-liter "Cammer" crate engine. Listening to their customers they swapped the electronic fuel injection for four downdraft Weber carbs, Ford racing intake and MSD ignition. This is one very hot car and pretty much the Mustang of the my dreams. Luckily for me the guy who lives next to my mum restores and races Mustangs so I can walk next door and dream. 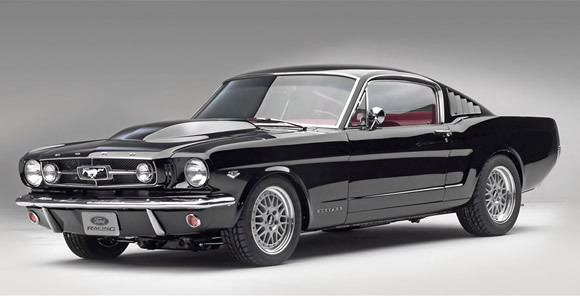 Beautiful vintage 'Stang with a 420HP sting under the bonnet. More beautiful shots here and more info here. That is one of the most beautiful muscle cars of all time! hmm lower hood . in my opinion only, i feel it tkes attention away from the rest of the body. plain hood would do in my case. This is my dreamcar. The one that you get to buy when you are probably to old to look good in it. Awesome car.